It used to be that biographies were written years, often decades or even centuries after a person’s passing. The current trend is to write about people who have achieved greatness in their field during their lifetime. Shawn Carter (he took the name Jay-Z later) grew up in Marcy Houses, a Brooklyn housing development for low income families. Family life was happy. Music filled the home, which became “the house around the neighborhood that everybody went to because we had all the newest records, and we just had super cool parents.” Dad introduced young Shawn to chess and basketball and music. Tragedy struck and Dad left the family, obsessed with finding his brother’s killers. Mom became the bread earner. We get a picture of strong parents who cared for their children and believed in them. When Shawn took to writing rhymes his mother gave him a three-ring binder to record them in. 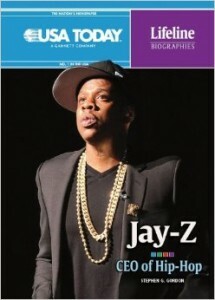 The book conveys well the ethos that formed Jay-Z. His talent was honed in the Marcy development where hip-hop was in the air. Neither Jay-Z nor the author hide his drug-dealing days, the dark times he fell into, and the growing realization that “this life has no good ending.” Fortunately for him and for his fans, he had friends who steered him away from the dark path. What comes through is the portrait of a genuine person, not just a celebrity air-head, growing in strength and understanding of the world. The book details why he decided to go indie in the production of his first record. We follow along as he goes from strength to strength, building his musical empire, diversifying into a very successful clothing line, using his millions for philanthropy. His marriage to Beyonce was a very private affair. He celebrated the birth of his daughter with a song for her. “In the course of his career, Jay-Z had brought rap music from the streets of Brooklyn to the finest concert halls in the world. In the process, he had broken down barriers.” And this may well be the greatest achievement of a prodigiously talented artist. The back matter provides much information for discussion and reading activities. There are many photographs and articles from the newspaper USA Today. Middle school and high school students will enjoy the book, learning much about negotiating the difficulties of life even as Jay-Z did. A worthwhile addition to all reading lists.